My mom made all the time when I was growing up. I love the memories as much as I love the cinnamon-sugary goodness. Jake likes this coffee cake because he says it taste like a donut. 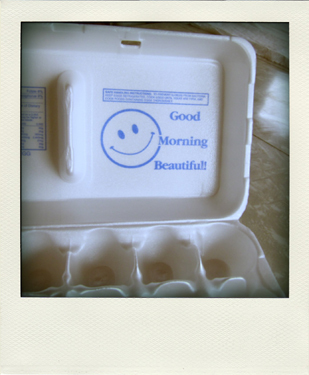 Basically, if you like happy breakfast memories, cinnamon-sugar, and donuts, you’ll la la love this. P.S. I just want you guys to know that this is one of the best coffee cakes in the whole world. And that’s why I decorated it flag-style. 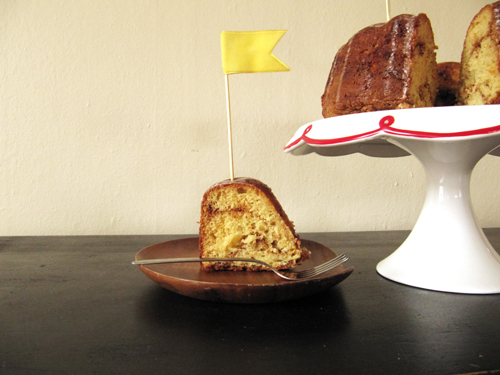 That, and the fact that now I can say that this is a bundt with a bunting. Ha! Heat oven to 325°F. 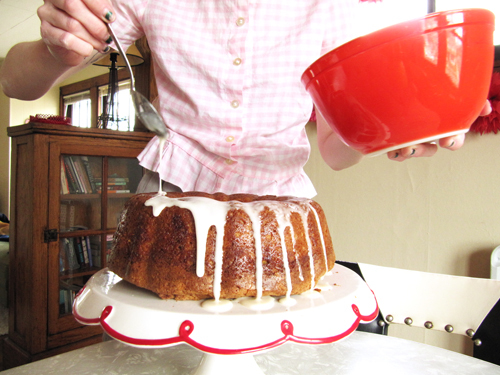 Grease the bottom and sides of a bundt pan with generously with cooking spray. Make cinnamon filling by whisking together brown sugar, cinnamon and nuts if using. In a small bowl, mix flour, baking powder, baking soda and salt. In a large bowl, beat the granulated sugar, butter, 1 1/2 t vanilla and eggs with an electric mixer on medium speed for 2 minutes, scraping bowl occasionally. Beat in flour mixture alternately with sour cream on low speed. 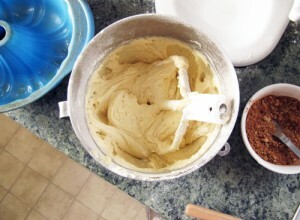 Spread 1/3 of the batter (about 2 cups) in prepared bundt pan; sprinkle with 1/3 of the cinnamon filling (about 1/3 cup). Repeat twice (or repeat just once more if you’re like me). Bake for about 1 hour or until a skewer inserted near the enter comes out clean. Cool in the pan for 20 minutes before inverting onto a cake plate. I knew I bought these eggs for a reason! I can ALMOST smell this…one of my true favorites!! My goodness, I want a bite! Yum! My Aunt Bea used to make this for St.Pierre Christmas every year. But she called it Merk’s coffee cake. 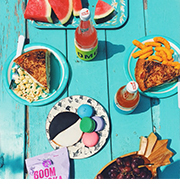 Fun & delicious memories. Marjorie Rose – I wish I could give you a piece! 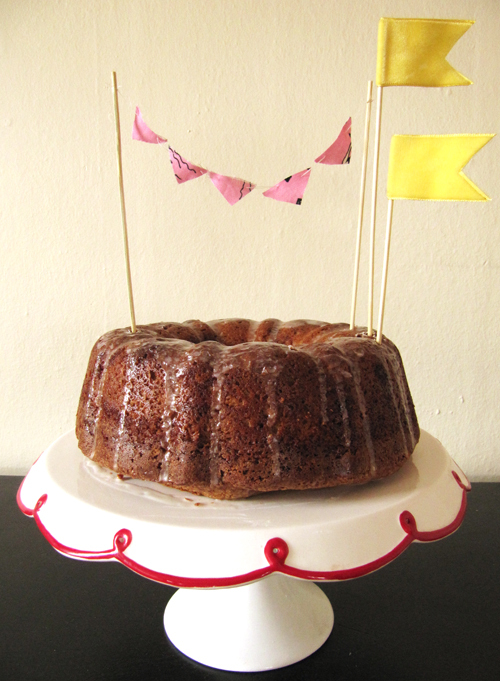 I love the bundt cake with bunting. (I’m a sucker for puns.) And you just can’t beat Betty Crocker for a good coffee cake. Looks delish! Thanks Shelley! You’re so right. Betty is one hip lady. 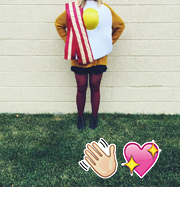 And thanks for showing me that snazzy etsy store. I know this recipe! It’s such an awesome cake! Yes! Everyone needs to know this recipe! It’s too tasty to miss. 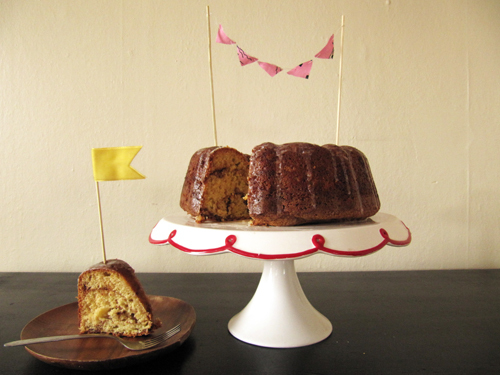 a bundt w/ a bunting…ahahahah!! i love bundts and cinnamon-sugar. and donuts. OOH Cindy, you’d love this! What a magnificent looking cake! Must be super moist with the sour cream. Yum! any chance some kind of stout could used in this for a coffe stout cake e.g. southern tier mokah or javah or mikeller beer eek brunch weasel edition? Gorgeous cake! Love those banners and I know it must taste like pure cinnamony awesomeness. PS. your the Pixies reference = the peak of my day.